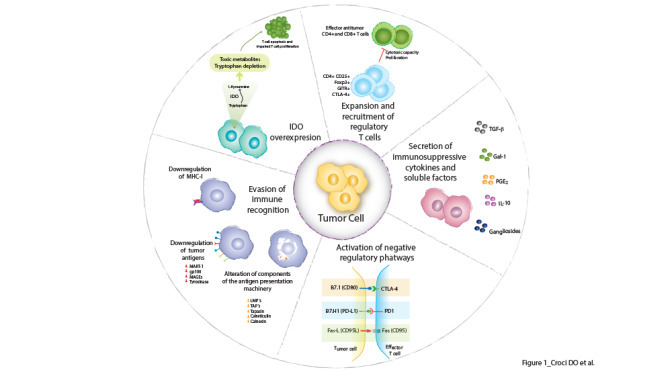 Tumors overcome anti-tumor responses employing immunosuppressive strategies. Tumors overcome anti-tumor responses employing immunosuppressive strategies.These include tumor-induced impairment of the antigen presentation machinery, activation of negative costimulatory signals in the tumor microenvironment (CTLA-4/B7, PD-1/PD-L1, Fas/ FasL), elaboration of immunosuppressive factors (IL-10, TGF-β, Gal-1, gangliosides, PGE2), and overexpression of indoleamine 2,3 deoxygenase (IDO). In addition, different regulatory cell populations contribute to this immunosuppressive network including CD4+CD25+ regulatory T-cells and inducible T regulatory (Tr1) cells which negatively impact on the fate of Th1, Th2 and CTLs. Abbreviations: Gal-1: galectin-1, PGE2: prostaglandin-E2, TGF-β: transforming growth factor beta, MHC-I: major histocompatibility complex, TAP: transporter-associated protein. Croci et al, Cancer Immunol Immunother, 2007.